Type of Network:Jio is the only network which offers advanced 4G LTE technology on all its sites. Jio is also the only network in the country which offers VoLTE technology for voice calling on all of its sites. Width of the Network/ Number of base stations: Jio has approximately 5.32 lakh4G LTE network base stations and covers more than 95% of India’s population. The number of base stations clearly establish that Jio is the widest operator in terms of number of base stations. Quality of the Network/Speed: TRAI’s My Speed application, which is a crowd sourced application testing speed of network and which does not engage with any operator on commercial basis, has consistently reported Jio to be the fastest network operator, since Jio’s commencement of services. 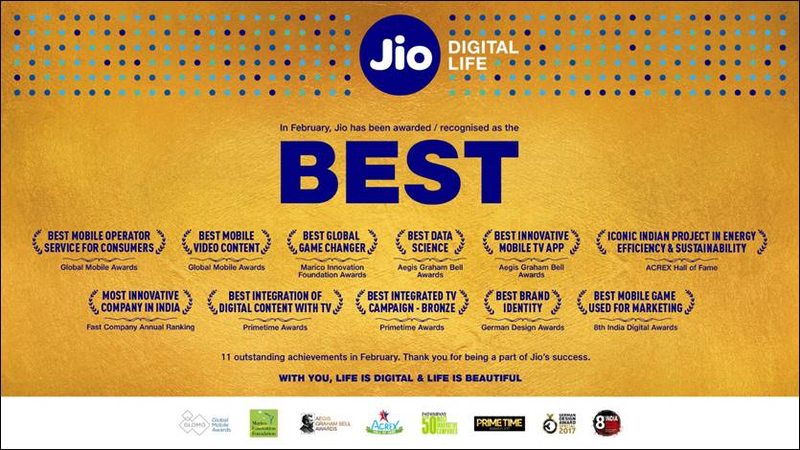 Best Network ranking: Jio's contribution in bringing India at the forefront in global ranking has been acknowledged by various officials and dignitaries including recent statement at the Mobile World Congress (“MWC”), a prestigious and world renowned industry platform involving participation of various operators across the world, where Jio won 'Best Mobile Operator Service for consumers'. - Offers advertisement-free movies, TV shows, music, short clips and is comparable with any other movie content application available on the internet, which does not offer pirated or illegal content. - Enables users to download and watch content offline. - Provides special features, including voice search, dock player, video quality/ bit-rate selection, syncing across devices, pause-and-play, watch-list creation, etc. - Delivers auto-play functionality when browsing TV shows. - Enables users to seamlessly access content from other platforms/channels, including Eros Now, Alt Balaji, Arre, VB, etc. - Compatible with third party casting services. - Provides special features, including reminder alerts, dock player, syncing across devices, pause-and-play, etc. - Offers unique ability to lock-screen to enable disturbance-free viewing. - Enables users to seamlessly access content from other platforms/channels, including Hotstar, etc. - Provides more music content in more than 20 Indian languages and international music. - Enables the unique ability to tap-and-play/queue any content. - Free storage of up to 5GB of data. - Allows the user to watch videos and listen to music files without any delay and without downloading them to the device. - Provides easy sharing and storing of files and folders in any smartphone or PC. - Enables features such as automatic backup of files, simple access of files, folder creation for organize such files, syncing contacts across devices etc. - Keeps data safe by remotely logging out when user lose their device. - Enables users with features including live cricket scores, breaking news notifications, monitor stock market etc. - Allows the user to save and share articles with their social circle. - Allows the user to read news from all leading dailies in more than 10 languages. - Users can save newspapers, auto-download and find articles within the newspapers to clip and save articles of their choice for future viewing. - Enables users with features such as resume reading, easy navigation, tap and view the reader screen etc. - Offers a vast library with premium and popular magazines and a wide choice in regional content. - Provides instant access to selected magazine articles and is convenient to read on any screen size. - Allows user to highlight, underline, bookmark or let the app read out articles in offline mode. - Enables users with features such as playing of videos, podcasts and presentations along with the articles, sync downloaded magazines across all their devices, set timers to download magazines, auto-delete button, voice search, save and share their reads on social media. - Provides users with rich collection of games across genres. - Allows the user to set and check top scores and get featured in the leader board. - Provides users with audio and video calling feature including audio and video conference calls. - Allows the user to create random doodles while chatting and other features of rich communication services. - Provides features such as group chatting, voice notes, ‘do not disturb’ mode, sharing of files up to 100MB, 1000+ fun stickers etc. - Provides various entertainment and infotainment related channels. - Has recently conducted one of India’s largest play-along games on an application. - Offers a user-friendly and intuitive design for customer support and self-care. - Allows user to check balance and validity of recharge plan, link and manage multiple Jio accounts, install and access Jio Apps, buy, store and transfer voucher(s) in digital format etc. - It also provides an option for delivering Jio SIM to users at their doorstep. - Extends help and support to users by providing FAQs, helpful tips and troubleshooting features. - Provides free entertainment and gaming content. - Has recently conducted one of the largest play-along games on an application. - Book tests, consult doctors, manage your weight & much more. 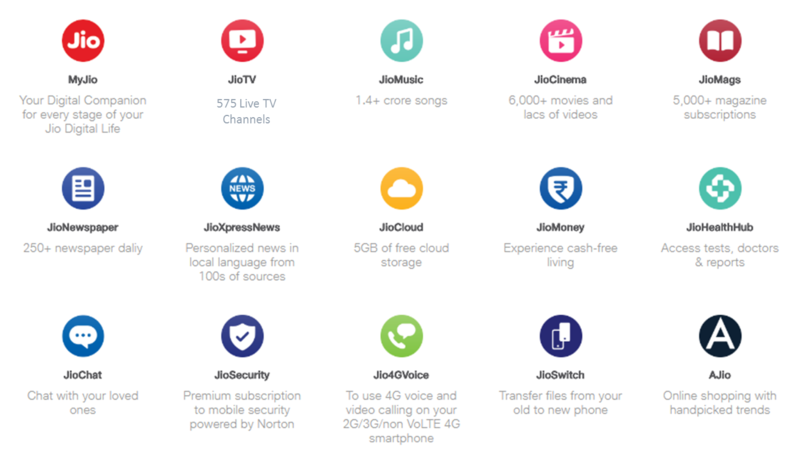 In addition to the above applications and services, RJIL also facilitates provision of various other applications, including Jio Switch (rapid media sharing), AJIO (fashion and shopping), Jio Money (mobile wallets and loyalty points) and Jio Security (cyber security) which complement and enable users to experience wholesome and fulfilling entertainment, at all times. Jio has attained multiple awards globally for content and apps. Attaching one list for the month of February 2018 alone. - RJIL offers 5GB more 4G data at less than half the monthly rental offered by other telecom service providers in India. - Other telecom service providers (“TSPs”) offer 20 GB data free at monthly rental of Rs. 389-399 whereas RJIL is offering 25 GB data free with monthly rental of Rs. 199 only. Data Usage: Basis the figures reported by various operators to TRAI2, the data usage on Jio’s network is not only highest in India but also in the world3.